I went to the illustrator breakfast hosted by the Vancouver Children’s Literature Roundtable this past weekend. 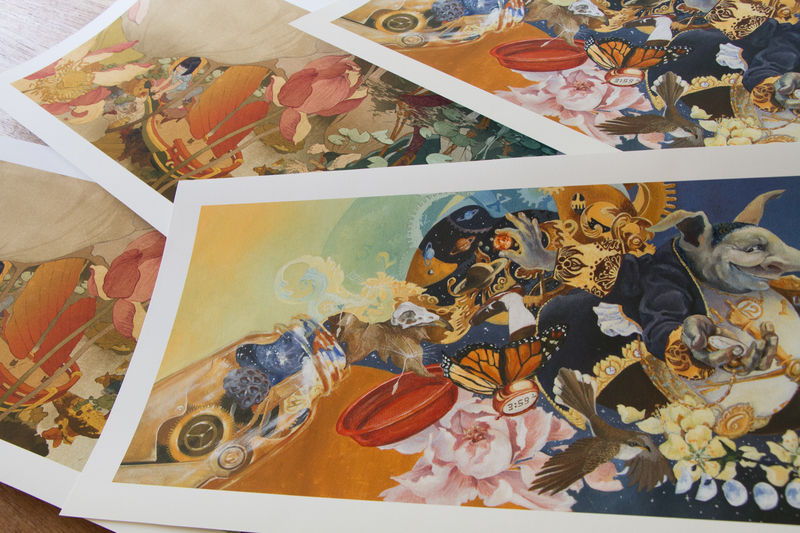 This year’s special guest was Shaun Tan (he was also doing a number of Writer’s Festival events). I’ve been a fan of his books and painting for a long time (I’m in love with the suburban sidewalk painting as well as the pelican one), so I just had to go. His presentation was funny, informative, inspiring, informal and entertaining. I think everyone could have listened to him for the rest of the day. I had brought 3 of his earlier books from home and bought his two most recent ones at the event (The Arrival and tales from outer suburbia) with the idea that I would get them signed. The signing lineup was HUGE with most people clinging to multiple books so I had a brief thought that perhaps I could forgo a signature and just duck out. But I’m sure glad I didn’t. I was also determined that when it was finally my turn, I wasn’t going to get chatty with him and hold up the line. But it was impossible not to talk to him – he engaged every signee in conversation. So we talked briefly about book design (tales from outer suburbia and The Arrival are especially beautifully designed – there is an absolute marriage of text and illustration which is so sadly rare in children’s books for some reason) while he signed each of my books with versions of either an embellished inked-fingerprint or a specially designed stamp with hand drawn elements. 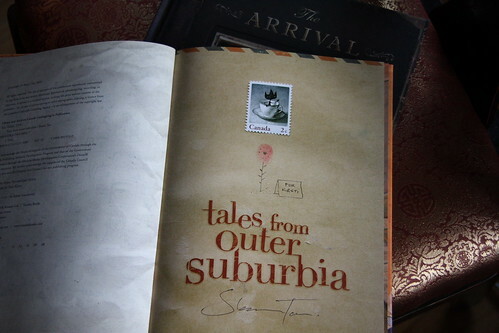 So I’m left feeling absolutely inadequate in the autograph-signing department (I’ve never had nice handwriting or been able to squiggle off a lovely little title page flourish) and humbled by Shaun Tan’s sheer talent and drawing endurance (The Arrival took 4 years to complete). But at the same time I’ve been inspired to spend more time with my hand wrapped around a pencil.